One of the perks of working from home is that, well, I’m home. Which means I can start my day by mixing up a loaf of bread, time my breaks right and have a piping hot loaf by the time my husband comes home for dinner. Today? 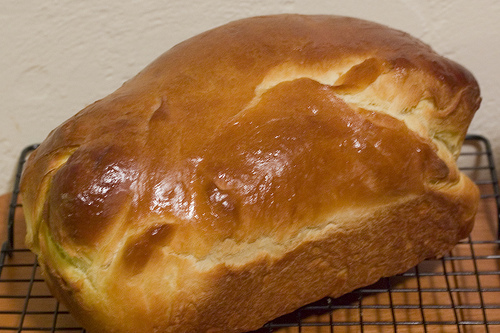 It was a loaf of eggy challah bread, recipe from the Joy of Cooking. My braiding skills are lacking, so instead of a braid, it’s a lumpy loaf, but it smells delicious none-the-less. Nothing better than homemade bread. Homemade Challah is the best! Yumm! That looks delicious! From culinary school, I think that the braiding is supposed to aid in even baking…but I bet if I reach back into my days of making it at Jewish summer camp as a kid, there was probably some other folksy or historical reason for braiding it (we’re keen on stories linked with food). Whateverrrr! It looks so yummy without it!